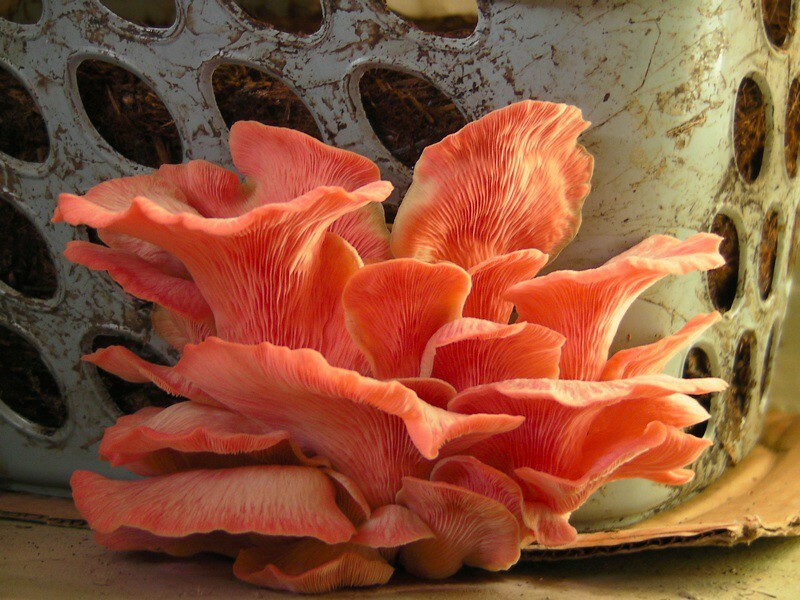 I love mushrooms, and I love even more knowing how my mushrooms were grown and having another local food source that is organic. I got together with a good friend of mine, David Goodman and we created this video showing the process of how we grew these tasty mushrooms. I grow ours in cheap laundry baskets. They already have holes and cost $1. I also tend to get bigger flushes. 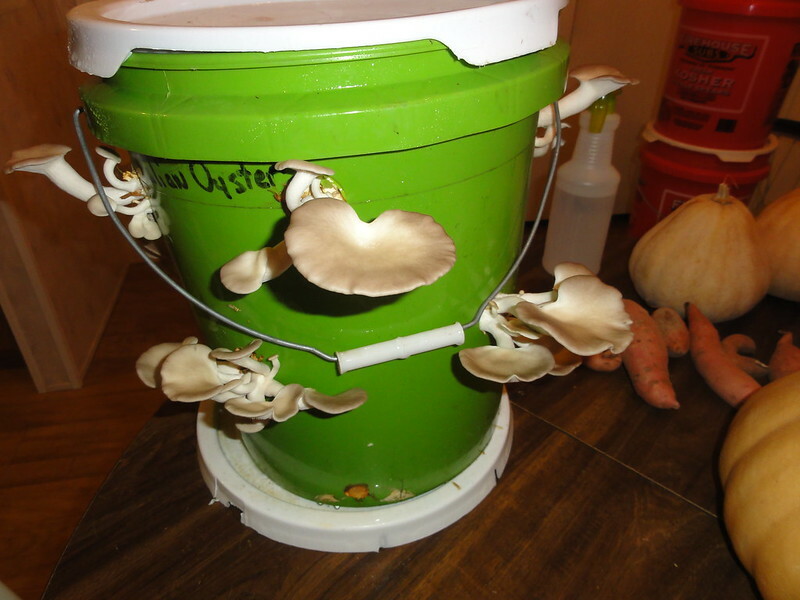 About 2 weeks ago I just started my first laundry basket of oyster mushrooms to compare against the bucket. Looks like you have an excellent fruiting! I didn't realize how much some look like Chantrelle's until I saw your pic! They're gorgeous!! I do a bit of mushroom hunting - actually can get chantrelle and matsutake mycelium to grow abundantly through whatever medium I want, but of course can't make the fruit, which is the goal - since they're symbiotic with certain tree roots. I just saw this post and it is a good idea. I grow some tomatoes every year but some years in Kansas it is so dry they won't grow even if I run the water all of the time. It costs me a lot for water with little or no results. So I created some tables with 55 gal barrels cut into trough shapes, this elevation helped to keep critters away plus water stays longer. When I lived in South Carolina my tomatoes grew without even trying because I was in LOW COUNTRY. I went to a commercial grower one time to help pick back in the 90's and the plants were stakes up well over peoples heads. Keeping humidity high does wonders for many plants. The baskets may keep the wind off plants so the water does not disappear so fast. Out here in the dust bowl farmers have had to lower their spray rigs down to plant level because the climate is so dry here that water will completely evaporate by the time it falls 8 extra feet to reach plants. Thanks for the basket idea. Also the sprays have slowly changed the soils PH til only special seed work well unless lime is added to change the soil back to alkaline. The sprays have become so bad the last 2 years that local water is raging out of control with bacteria with the city sending out notices warning NOT TO DRINK. So what does that do to the plants? Not fit for human consumption and plants die from it. The only way to grow things like they use to grow is to give Monsanto a call, order up some BT spray and BT DNA GMO all twisted into one strand. Don't eat much. Sell it with a warning label so you can sleep at night. The game is up on controlling seeds and crops. The Mexicans who are the Kansas slave labor have noted that their home gardens no longer grow with their regular seeds they are use to planting. The soil is acidic more so than ever. When the airplanes start dusting I get sick as I have been prone to pneumonia for the last 40 years. Then the fogger trucks come by at night while we are sleeping and poison the room air. BT is in the gut of every American with levels increasing everyday. Last edited by BroMikey; 01-01-2015 at 07:12 AM.